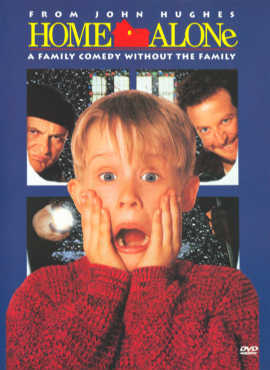 8-year-old Kevin McAllister is accidentally left behind when his family takes off for a vacation in France over the holiday season. Once he realizes they`ve left him home by himself, Kevin learns to fend for himself, and eventually has to protect his house against bumbling burglars Harry and Marv, who are planning to rob every house in Kevin`s suburban Chicago neighbourhood. Kevin`s mother Kate is frantic when she realizes that she and the family have unintentionally left Kevin behind in Chicago, and she tries to make it back to Chicago as fast as she can, getting help from a polka band leader named Gus Polinski.